As Reynolds’ division approaches the north end of Kelly Field the Federals notice Liddell’s Division blocking the Lafayette Road. The two brigades of the division form into line of battle and charge northward. Elsewhere, the final Confederate assault on Kelly Field begins in earnest. Stewart’s Division scrambles over Reynolds’ abandoned works just as Palmer’s division begins its withdrawal. At the same time, Cleburne’s Division begins its attack. 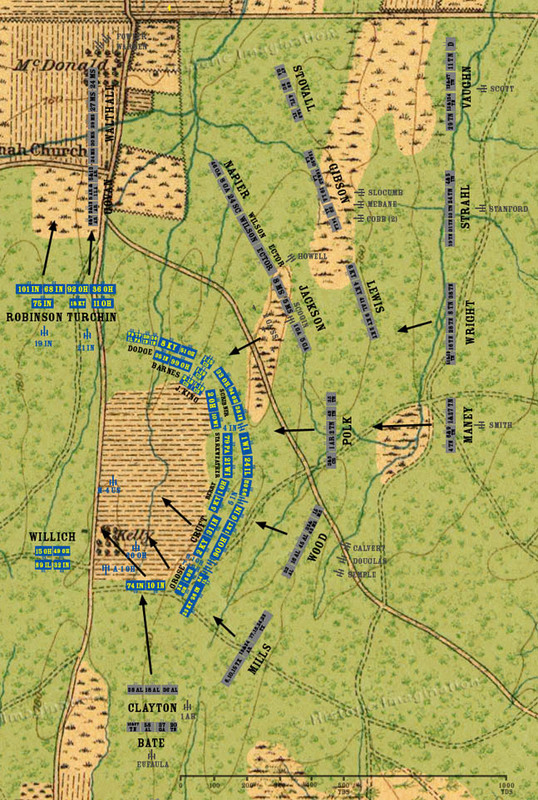 Jackson’s Brigade attacks Baird’s line and calls for support, prompting General Cheatham to send Wright and Maney’s Brigades forward.